Work began on the new jail in the first week of October, and the Towns County Herald reported that “the walls of the lower floor are being built twenty-four inches thick of rock and concrete while the second floor wall will be twenty inches thick.” One week later, the paper reported that “work on the new jail is progressing rapidly and soon the walls of the first story will be completed.” In the last week of October, 1935, “workmen were pouring the concrete flooring for the second story which will be six and a half inches of steel and concrete.” Work continued as weather permitted, and the Grand Jury of March 1936 was able to report that the new jail “is modern, safe, and sanitary in every respect and is very a commendable structure and improvement to our County.” They also praised Ordinary Dr. J. F. Johnson “for his faithful and untiring and economical efforts used in the construction of the jail” that cost the county only $4,353.31. The jail works, including a cell patented in 1901, were moved from the former jail and still remain in the Old Rock Jail. The Old Rock Jail functioned as the county jail from 1936 to the early 1970s when a new jail was constructed. In 1980, the building was renovated and used by the City of Hiawassee as a City Hall. Since that time, the building has been used for various purposes. 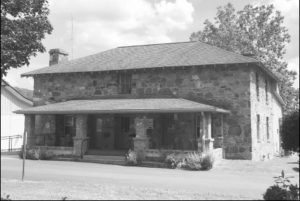 In 1985, the Old Rock Jail was added to the National Register of Historic Places. Grand Jury Presentments, September Term 1934, Superior Court Minute Book E, page 99. The Towns County Herald, March 28, 1935. The Towns County Herald, April 4, 1935. The Towns County Herald, October 10, 1935. The Towns County Herald, October 17, 1935. The Towns County Herald, October 31, 1935. Grand Jury Presentments, March 1936, Superior Court Minute Book E, page 143-144. Report for inclusion on the National Register.